Though your novel is set against the backdrop of the Korean War, can it help explain the larger divisions of North and South Korea that exist today? The Korean War is at the root of what separates North and South Korea today, a war that has never officially ended. This novel is drawn from my family’s stories—parents who were both born and raised in what is now North Korea, and a daughter who survived the Korean War and was separated from her family because of it. That separation is at the heart of The Kinship of Secrets. How does your own family’s story fit into your fictional family’s? My father came to America in 1948 to show his wife this new country he fell in love with, and to raise money for a church back home. Planning to return in a few years, they left behind their middle child, a daughter, with relatives—a decision that must have taken a great deal of faith. Everything changed when North Korea invaded the South on June 26, 1950. War, then U.S. immigration laws kept my parents separated from their daughter for ten years. During that first winter of the Korean War, my sister remembers fleeing Seoul in a cart pulled by my uncle, eventually walking about 100 miles south, then by truck 100 miles more to Busan. Another relative of ours lost hold of her five-year-old daughter’s hand during the mass exodus and never again found her. These are the kinds of family stories that I had to bring into my novel. 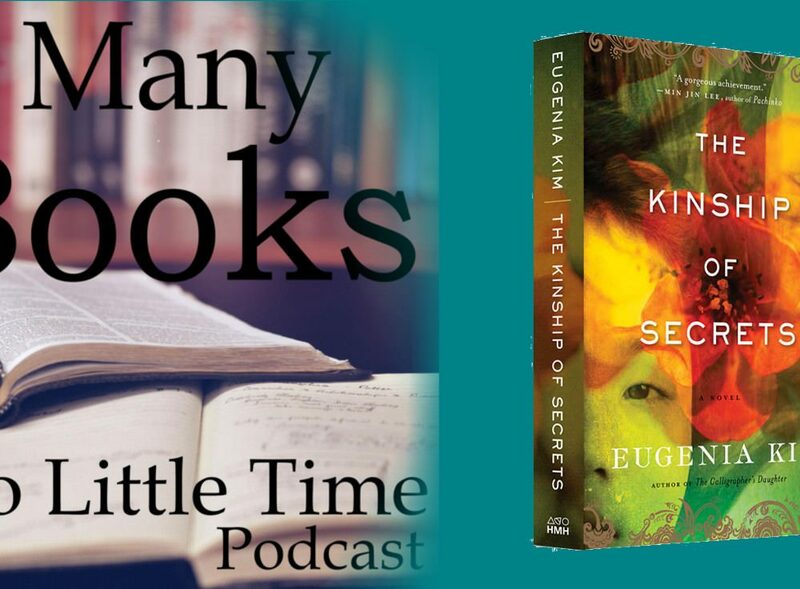 Was there a particular story that inspired you to write The Kinship of Secrets? 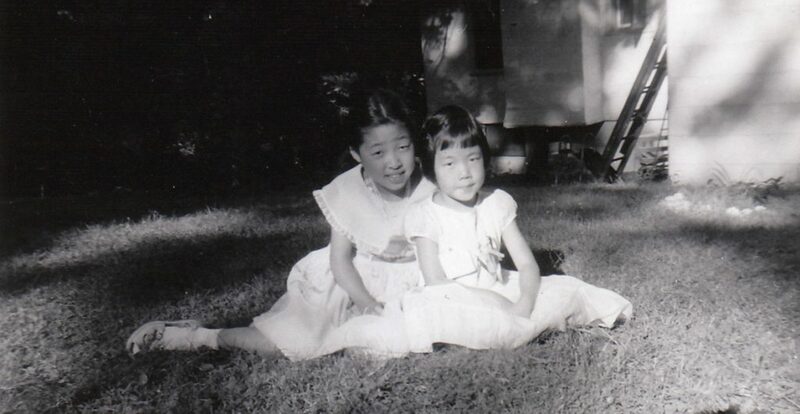 Ever since I was young, born in America, I always knew I had a sister, Sun, in South Korea, but was too innocent to ask about the circumstances of why she was separated from the family. And after she arrived at age eleven when I was five, I never questioned what it meant for her to come to America. Over time, I learned a family secret that grew intertwined with Sun’s story of being left behind, and that secrecy helped to cloud her story. Still, it never occurred to me to ask Sun what it was like to come to America—I assumed that all immigrants, like my parents, were grateful to be in this country. Sun was simply my bilingual “Korean sister,” whereas my four other siblings, all older, were totally Americanized, like me. Even when I felt I knew Sun so well, I knew so little about her history. 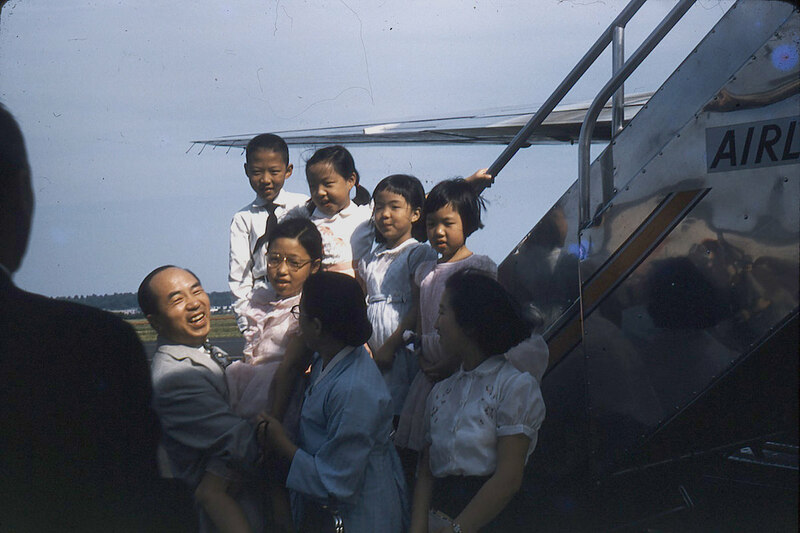 Sun arrives from South Korea in 1958. The author is top right. In 2005, my sister, who had by then returned to her homeland multiple times, accompanied me on my first trip to South Korea to research my first novel, The Calligrapher’s Daughter, and during a train ride I asked her at last what it was like to have come to the U.S. Her answer—that it was heartbreaking—surprised me, and took me on a journey into the story of her life. That was the beginning of what would become this novel. How closely does the book follow your sister’s story? There are definite departures and as many similarities. My sister arrived here at age eleven, but in the novel I wanted her to be old enough to express deeper emotion, so the character, Inja, is sixteen. Also, a sole sister, Miran, in The Kinship of Secrets occupies the position of five real siblings. In the process of writing a fiction inspired by true events, the line gets blurry sometimes, but the characters ultimately become selves unlike their real-life counterparts, and take on their own lives needing original scenes and situations to advance the story. Still, in this novel, much essence of true story remains, including the story about why Sun was left behind in Korea. You’ve said that the decision to leave her must have taken great faith. What was behind that decision? 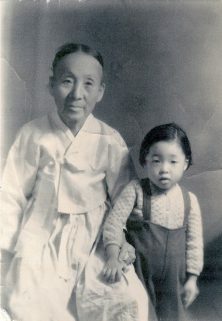 The author’s grandmother with Sun at age four. 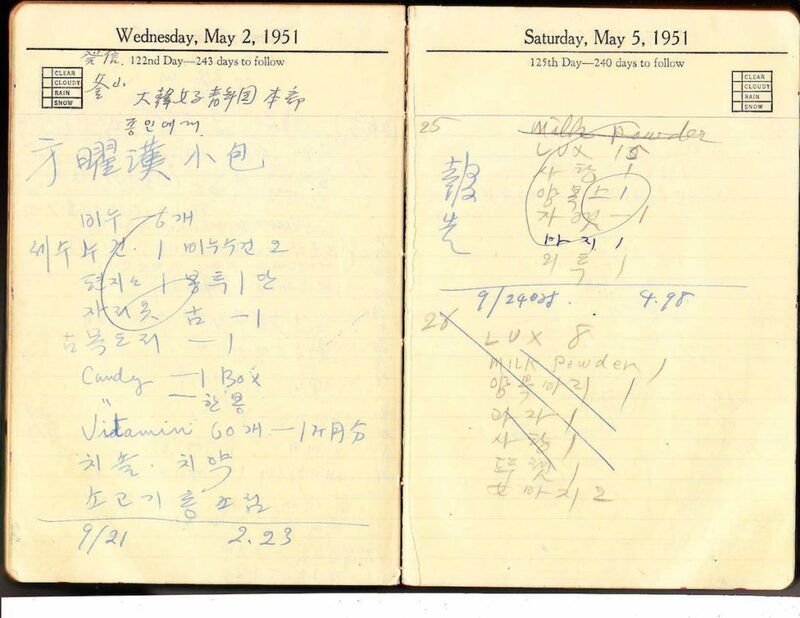 As mentioned, my parents came to America in June 1948 during a brief period of peace between the end of the Pacific War and the beginning of the Korean War. They only planned to stay two or three years then return. In Korean style and in postwar hardship, my parents and their family of three children lived in Seoul with my mother’s parents and my mother’s brother and his wife. Grandmother was distraught that this young family was leaving Korea. She believed that, having tasted the waters of America’s golden rivers, they would never return. So as a guarantee of their return, and because traveling by ship with three little ones was complicated, my parents decided to leave one child in Korea. The eldest, at three, was old enough to know that she’d been left behind. The youngest, a son, was not yet weaned. And so my sister Sun, age one, was left in Seoul with her relatives. In the novel, the choice is made between two children. The decision over which child to leave was I think in some ways a practical one, but also one that exemplified my mother’s tremendous faith and love for her own mother. Why couldn’t your fictional parents return to Korea and reunite with their daughter after the Korean War? Like my own parents’ experience, during the war my novel’s parents are only concerned about their daughter’s survival. By the war’s end, my own parents were rooted in America, and the novel mirrors this experience. 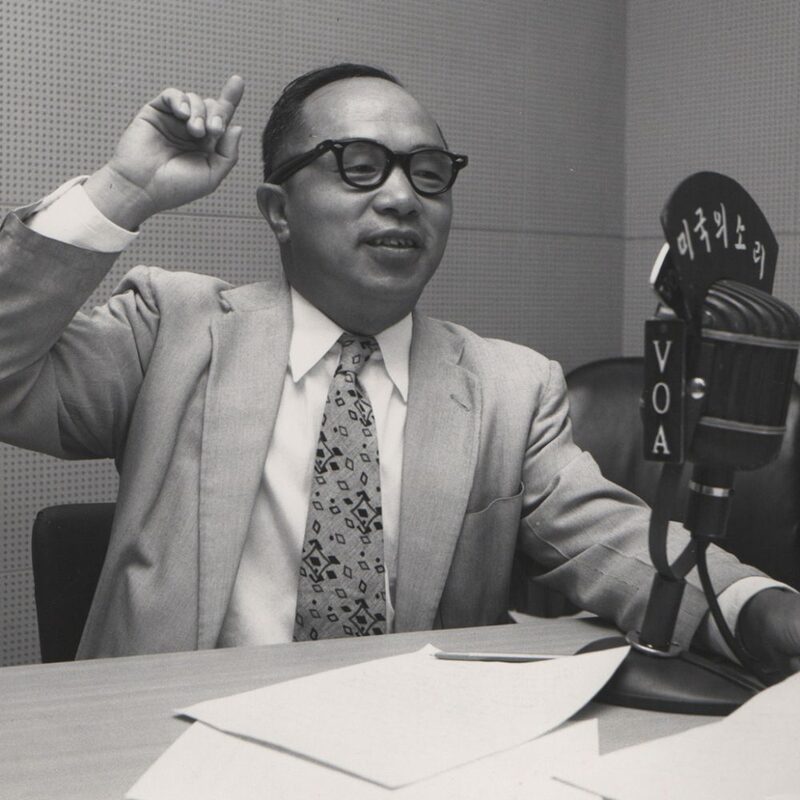 My father had a job broadcasting news and propaganda to North Korea at the Voice of America, and my mother was now raising four girls and a boy, longing to be reunited with her second child. As a result of his job, my father would have been a prime candidate for kidnapping or assassination by the North Koreans. Also, it was discovered they were illegal aliens and so their status in the U.S. had to be handled. While the novel tells an intimate story of two sisters separated by the Korean war, it is also the story about parents whose anguish over their missing daughter dominates every aspect of their lives, as it did my parents. My mother’s yearning for her child is exemplified in the photograph at right, where she cut and pasted an image of her missing daughter onto a family portrait. But it took a decade and an act of congress to bring her to America. Sun was raised by our aging grandparents, a loving uncle, and a stern aunt. At front left is the cut-out photo of the missing daughter, pasted onto a family portrait taken around 1950. My uncle took responsibility for his niece seriously. 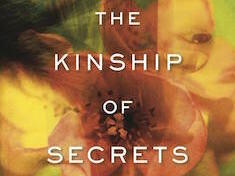 The Kinship of Secrets imagines what her life was like during and after the war, growing up in close quarters with relatives. I did return to Korea in 2010 to visit Busan and the neighborhood where Inja lives during the war. I read many histories and American and South Korean narratives about the Korean War and postwar eras, and created an extensive timeline of which I may have actually used very little. But the underpinnings were critical in order to know what life might have looked like as a result of historical and cultural milestones. The internet grew more robust in the seven years it took to write The Kinship of Secrets, and using Pinterest, I compiled hundreds of images from university libraries, periodicals, historical sites, and Korean War veterans’ photographs. Most helpful were candid photographs of citizens during the war, period street scenes, and refugees on the move. Seeing as how the novel is linked to your family’s story, what part means the most to you? That’s hard to say. The kinship of the sisters was fun to imagine, and of course the secrets in the story are important as they come to shape each sister’s life. One of the book’s motifs that held my attention was the aching connection between mother and daughter. Najin sends packages of dry goods to Korea monthly, then during wartime, two or three packages weekly. In actuality my mother kept meticulous lists in old diaries of all her relief packages, even the cost of postage. I was happy to have such details to use in the novel. Scattered among her diary entries were bursts of narrative of my mother blaming herself for the decision to leave Sun behind, and her growing despair at the prolonged separation. Even before I was aware of my sister, I was aware of the important link of packages to Korea. So when I was given my mother’s diaries at the beginning of this project and Sun helped me to translate them, I had a new connection both with my sister and my mother, who had passed in 2003. From these diaries I learned firsthand a little about my mother’s heartache, as well as what from second-hand America was useful overseas. I think this is integral to the life of an immigrant family—gratitude for support in times of need given in a spirit of generosity and community. A page from the author’s mother’s diaries. What part was the most fun to write? I enjoyed whenever the sisters were together. Each helped reveal the others’ character to the reader in a natural, cinematic way. Also the bedpan story—but I have to leave it at that! Looking forward to reading this book to learn about my secretive family history. It’s never too late to finish, and it takes time to finish it properly. I hear ya! And look forward to seeing you soon! I have just found that Eugenia Kim wrote another novel. I ordered it immediately though Amazon. Thank you Eugenia. I had close relationship with her mother, Alice Kim (Han Hae Kyung). She was an Ewha Womans University alumna.I respected her deeply. Thank you so much. It is rare to find friends of my mother, so I’m so pleased that you wrote. Thank you for a wonderful book. It brought back many memories for me. My father was an American engineer on the lightship jacona in Busan harbor . We joined him in November 1949. We lived at the Hialeah compound in Busan. In June 1950 I woke up to find my parents packing everything and the next morning we were loaded on trucks and the a ship that took us to Japan and eventually flew back to Boston In 1957 we returned to Korea , my father was now a missionary and we lived again in Pusan . I was in high school so I went to boarding school outside of Tokyo and only visited Korea at Christmas and for the summer . One summer we drove to Taejon beach so probably retraced some of the journey in your book . To earn my way back to the U.S. for college I signed on with Holt Adoption and helped with a plane full of babies and toddler’s being adopted in the states . I stayed several weeks at their facility in Seoul . My parents left Korea after five years and did not return but Korea has always been a part of our story. Thank you for your book! Merry Christmas . Thank you for writing. It’s wonderful to hear your story. The Holt baby plane is famous, so you were part of history! I appreciate your comment and thank you for reading The Kinship of Secrets. Happy Holidays! What a beautiful, heart wrenching and heart warming story. Thank you for sharing your family’s story through this epic journey of Inja’s life. 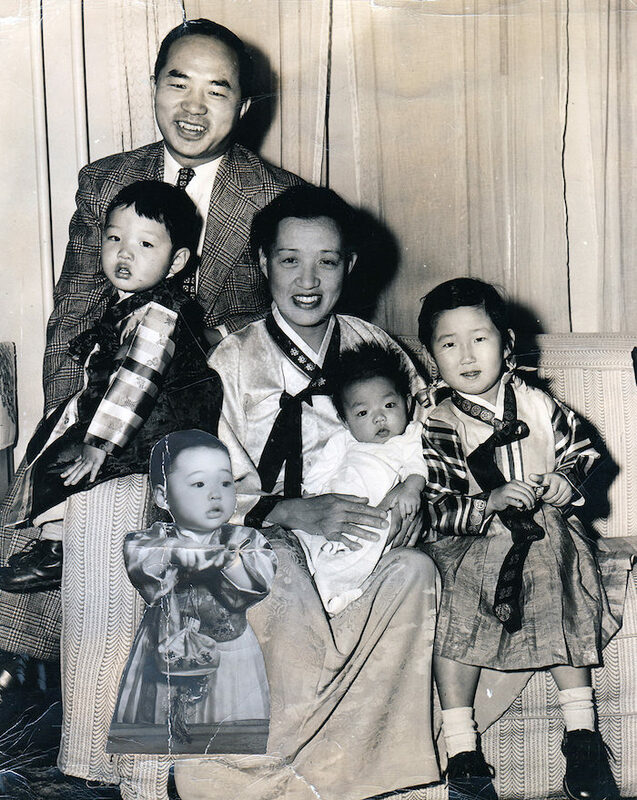 I felt a profound “kinship” with Inja in that I too was left behind in Korea by my father who left me with my grandparents and his younger siblings to come to Canada and start a life with his new wife and their son. There also was much secrecy and much that was left unsaid regarding his decision to leave me. I was eventually sent to Canada to join the new family, however, I was and am very much attached to the relatives who raised me. My story started in the early 70’s and still continues to this day. Not only am I on a path to uncover the secrets and untangle the details of my early life, my husband and children have join me on my journey to discover our Korean roots. With our trip to Korea last summer, they have started to build a close relationship with our extended family that live so far away. There were countless passages in the book that felt like I could have recounted myself. Sun’s journey recounted through Inja, though divided by time and circumstance from mine, has made me feel less alone in my own life journey. Thank you for this.